The livelihoods of the world’s poor rise and fall with the fate of agriculture. Enhancing the ability of smallholders to connect with the knowledge, networks, and institutions necessary to improve their productivity, food security, and employment opportunities is a fundamental development challenge. Where once rural areas were largely disconnected from the greater world, today, networks of information and communication technologies (ICTs) enmesh the globe and represent a transformational opportunity for rural populations, both as producers and consumers. However, realizing this opportunity requires a long-term commitment to mobilizing appropriate resources and expertise. This training program is designed to support practitioners, decision-makers, and development partners who work at the intersection of ICT and agriculture. Our hope is that it becomes a practical guide in understanding current trends, implementing appropriate interventions, and evaluating the impact of those programs. 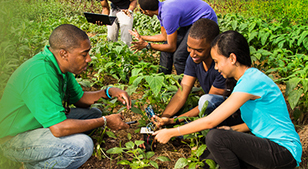 Gain basic skills in ICT in agriculture. Appreciate the need for ICT integration in agribusiness development. Understand current trends in ICTs as they pertain to agriculture and the contributions that ICT can make to enhance agricultural strategies and their implementation. Design, implement, and evaluate appropriate and sustainable ICT components of agricultural projects. Build effective public and private partnerships to promote ICT access and innovation for agriculture. Include ICT in policy dialogue and planning with country counterparts on agricultural and rural development goals and priorities. Understand the application of ICT in farm production, inventory management, and marketing and in extension services. Gain knowledge on gender equitable skills in ICT development in agriculture which is a major player towards rural development. This conference is intended for various actors in the Agriculture Extension (Agricultural extension officers, senior agricultural officials and policy makers) working with communities, in governments, funding agencies, Research organizations and non-government organizations among others for Agriculture support activities and other Development programs. Course participants are invited to highlight topics of interest before the detailed course schedule is prepared for commencement. This will usually be on the orientation day. Every effort will be made to accommodate participants training needs within the general scope of the course. Practical participant-centred activities are fundamental to all courses. In line with adult learning principles, maximum use is made of syndicate exercises, case studies, field trips, role-playing, management games, plenary sessions and training videos. Participants are encouraged to be directly involved in analysing and solving managerial problems. Prospective participants seeking a place on programs should make early application in writing to one or more donor agencies in their respective countries to secure funding possibilities.